Former Ulster coach Neil Doak will join Worcester Warriors on a two year deal from the summer. The 45-year-old Ulsterman will be the second new addition to the coaching team ahead of the 2018/19 campaign, following the news last month that Rory Duncan will move to Sixways as Head Coach from the Cheetahs. 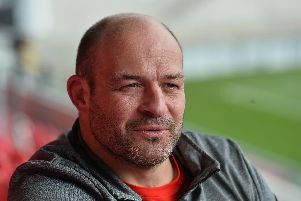 Doak was appointed as Head Coach of Ulster Rugby in October 2014 and enjoyed a 23-year association with the province. Doak was quickly promoted to the senior set-up in 2007 where he took up the role of Skills Coach and Ulster A Head Coach and then in 2008 became Ulster Attack & Backs Coach. Warriors Director of Rugby Alan Solomons added: “Neil played under me during my time at Ulster. He was an outstanding scrum-half with an excellent feel for the game. Doak added: “There are some fantastic backs at Worcester and I can’t wait to link up with them and Alan Solomons.